A sea of red washed over global financial markets on Friday in reaction to Britons' shocking vote to Brexit the European Union, with the British pound down to its lowest point since 1985 and the Canadian dollar lost more than a cent against the U.S. dollar. A sea of red washed over global financial markets on Friday after Britons' shockingly voted to Brexit the European Union. The pound fell to its lowest point in 31 years, the Canadian dollar lost more than a cent and stocks tumbled. The Toronto Stock Exchange dumped 239.50 points to close at 13,891.88. On Wall Street, the Dow Jones industrial average had its worst day since August, dropping 610.32 points, or 3.4 per cent, to 17,400.75 in heavy trading Friday. The Standard & Poor's 500 index fell 75.91 points, or 3.6 per cent, to 2,037.41. The Nasdaq composite sank 202.06 points, or 4.1 per cent, to 4,707.98 for the market's the worst fall since 2011. 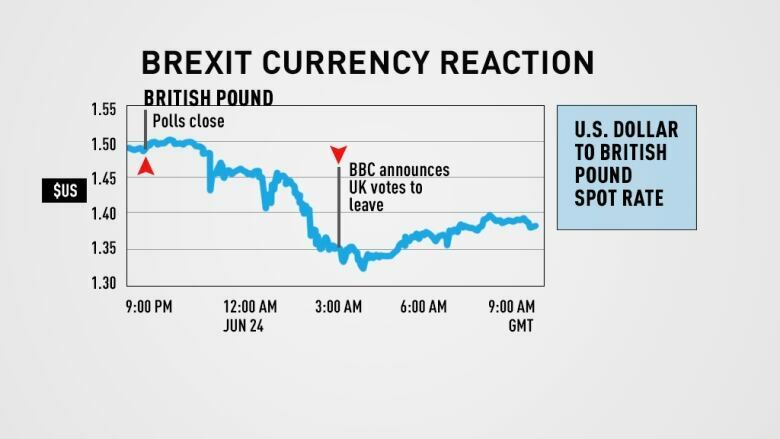 "The initial financial market reaction was especially sour, mostly because the market had become so convinced that Remain would win and not so much because it's a massive negative for the outlook," said Douglas Porter, chief economist at BMO Capital Markets. "We're headed into a rough week," said Karl Schamotta, of Cambridge Global Payments. Uncertainty over the vote results sent the British pound on a wild ride. Just after polls closed Thursday, when the Remain side was presumed to have won, it rose to its highest point of the year at $1.50 US. But as the results came in, the pound tumbled more than 10 per cent to $1.3230, its lowest level in 31 years. It later regained some lost ground to trade around $1.3679. That swing, to its lowest level since 1985, marked the biggest one-day move in the history of the modern pound, shocking financial markets, as pollsters and forecasters had almost uniformly predicted a narrow victory for the Remain side. Canadian-born Bank of England governor Mark Carney moved quickly to try to calm the nerves of investors. "We are well prepared for this," Carney said. "The Bank Of England will not hesitate to take additional measures as required." That wasn't enough to save the pound, however, as most world currencies slumped with investors rushing to the safety of the U.S. dollar. At one point, the Canadian dollar was down by more than 1.5 cents, which would have been its worst one-day performance since 2010. The loonie ultimately finished with a loss of 1.37 cents, ending at 76.93 cents US. The impact on many aspects of the economic picture is unclear. But in the short term, the referendum result is having a significant impact on just about everything. "Clearly, there will be no rate hikes for the foreseeable future," Bank of Montreal said in a note after the votes were tallied. "In fact, rate cuts are now a distinct possibility in the U.K."
The whipsaw trading was part of broader turmoil in global financial markets sparked by the vote. "The uncertainty, the not knowing, will not bode well for financial markets," BMO said. The euro weakened to $1.1108 US, down 2.81 cents US. The August contract for light sweet crude dropped $2.47 US to settle at $47.64 US a barrel in New York, after having earlier been down by as much as five per cent. Gold, which touched its highest point in two years after results showed the Leave side had won, closed at $1,320 US an ounce, up $58.80 on the day. Gold typically rallies during times of economic uncertainty. Britain's FTSE 100 dropped 3.1 per cent. At one point it was eight per cent lower. The German DAX index sank 6.8 per cent and France's CAC 40 index tumbled eight per cent. Japan's Nikkei 225 finished a wild day down 7.9 per cent, its biggest loss since the global financial crisis in 2008. South Korea's Kospi sank 3.1 per cent, its worst day in four years. Hong Kong's Hang Seng index tumbled 4.4 per cent and stocks in Shanghai, Taiwan, Sydney, Mumbai and Southeast Asian countries were sharply lower.